England - the future.... - Hob Nob Anyone? I remember back in 2001 an Everton supporting mate of mine told me to "watch out for a kid called Wayne Rooney".....2 years later he bangs in a beauty against Arsenal on his debut. George Green (Everton) - apparently the next "Gazza"
Izzy Brown (West Brom) - Considered one of the country’s best prospects. Alex McCarthy looks to have the making of a fine keeper, whether that is with Reading or another club remains to be seen of course. Same also goes for Butland from the bits and pieces I've seen of him. Aside from experience, both are already superior to Foster IMO. Hasn't Josh McEachran been the next big thing for about the last 4 years? Barry the bird boggler Alex McCarthy looks to have the making of a fine keeper, whether that is with Reading or another club remains to be seen of course. Same also goes for Butland from the bits and pieces I've seen of him. Great name, it’s a shame his academy team-mate Nortey Nortei hasn’t made a breakthrough yet. soggy biscuit Hasn't Josh McEachran been the next big thing for about the last 4 years? He's still only just turned 20, and looked very good the few times I saw him for Middlesborough last season. There's still plenty of time for him to break through, and its not easy getting into a team like Chelsea's at that age. Not sure on the real youngsters but the next season could be big ones for the likes of Raheem Sterling, Nick Powell, Connor Wickham, Thomas Ince (depending where he goes), Luke Shaw, Will Hughes, Ross Barkley and Chalbolah. A bits be said about the lack of English talent in the Premier League, but I think the standard of the Championship isn't far off what a lot of the young talent we had 15/20 years ago were playing at in the top flight so not sure it's a massive problem really. England U21 lost tonight in their European Championship opener. No surprise with that useless prat Pearce in charge. Relegated as a manager with Forest, abject failure (and sacked) at Manchester City. And he gets a top job.....because he pumped his fist so hard when he scored a penalty against Germany in Euro 96? Is this man fit to coach our best young players, I think not. Jobs for the boys. Sums up our national game really. And why we win and will continue to win nothing at international level for a long time to come. I suspect the blame is probably more legitimately placed at the door of the academy coaches and club managers who have had the players go through their hands over the last 10 years than Pearce, who has them for all of a few weeks a year. Not that I disagree with the general sentiment though! floyd__streete England U21 lost tonight in their European Championship opener. No surprise with that useless prat Pearce in charge. Relegated as a manager with Forest, abject failure (and sacked) at Manchester City. And he gets a top job.....because he pumped his fist so hard when he scored a penalty against Germany in Euro 96? Is this man fit to coach our best young players, I think not. Or the players out on the pitch. Italy even at u21 level show how much more superior they are. But 'ees got passion, innit. floyd__streete And why we win and will continue to win nothing at international level for a long time to come. 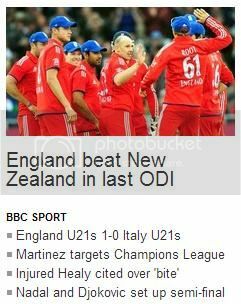 We did at least manage to win the game according to the BBC headlines, if nothing else. Why does everyone hate Pearce so much. He has a decent record as U21 manager and isn't exactly helped by the fact that anyone who is half decent is promptly moved into the senior squad, never to return. We weren't that poor tonight and our goal should have stood. However Pearce was honest enough to admit Italy were better and were denied the most blatant penalty I've seen in ages. We can still get out of the group after this result. It isn't the end of the world. Italy are probably the best team in the competition. Zero shocks all round that England had their toughest game in 18 months. HaroLOLd used to constantly rave about him, comes on for 10 minutes in a dead-rubber and its "future England captain" this and "composed performance" that. Kitsondinho Why does everyone hate Pearce so much. He has a decent record as U21 manager and isn't exactly helped by the fact that anyone who is half decent is promptly moved into the senior squad, never to return. He's slatted, not hated, because he's a pretty poor manager. The talent he has available to him, and the opposition he generally faces, means he should have a very good record as the U21 manager but when you look at how his teams play and the odd team selections he's made throughout his tenure then you can see why he gets a bit of flack. Defensively his U21 teams have always looked pretty good, but going forward we very rarely look like a cohesive team and that really showed at the last tournament in 2011 when he had talents such as Sturridge, Welbeck, Cleverly, Walker, Bertrand, Rodwell, Sinclair and Muamba (who when he played over Mancienne showed how wrong Pearce had got it) available and yet we still struggled. It's a shame we don't send a stronger team so that more of the youngsters who really stand a chance of going to Brazil, or World Cups and Euro's beyond that, get a real taste for and experience of tournament football before going through it with the senior team. Hoop Blah It's a shame we don't send a stronger team so that more of the youngsters who really stand a chance of going to Brazil, or World Cups and Euro's beyond that, get a real taste for and experience of tournament football before going through it with the senior team. ZacNaloen Italy are probably the best team in the competition.